Ancient hieroglyphics and pools of blue water sit before endless vistas, at the end of this short, easy hike. 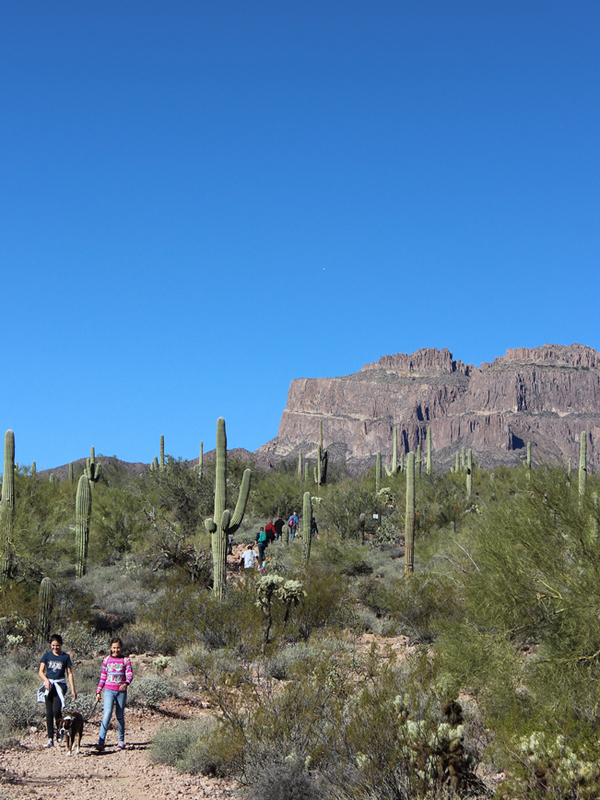 Gently ascending to the cradle of a vast canyon, the Hieroglyphics Hiking Trail leads to one of the Superstition Mountain’s most uniquely beautiful spots. The ease of the hike, along with its special features, make it a perfect jaunt to take out-of-town guests, to enjoy as a family, or to simply complete. 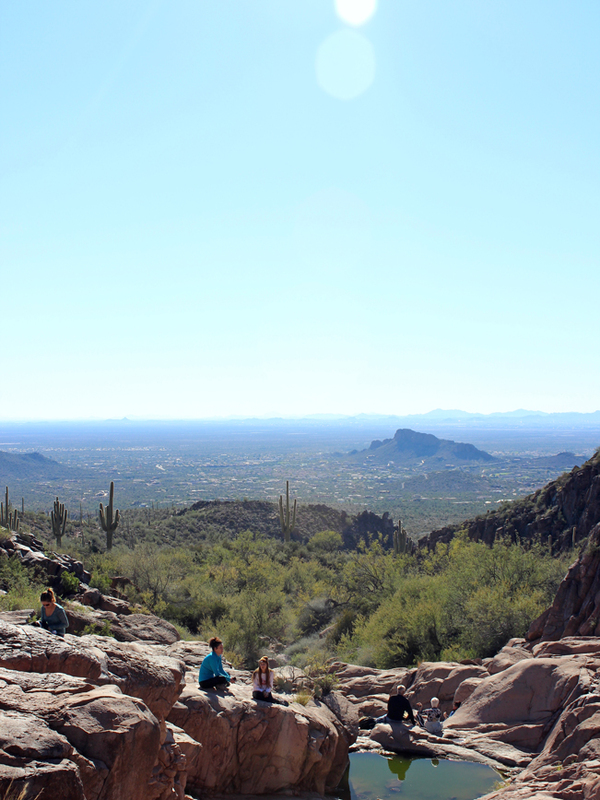 This hike is a favorite “go-to” trail for local Phoenicians. It’s truly awesome when an easy hike leads to an extraordinary place. The Hieroglyphics Hiking Trail does just that – leading to a unique mountain cradle, dotted with immense boulders, ancient hieroglyphics, pools of water and cascading waterfalls (after a heavy rain). 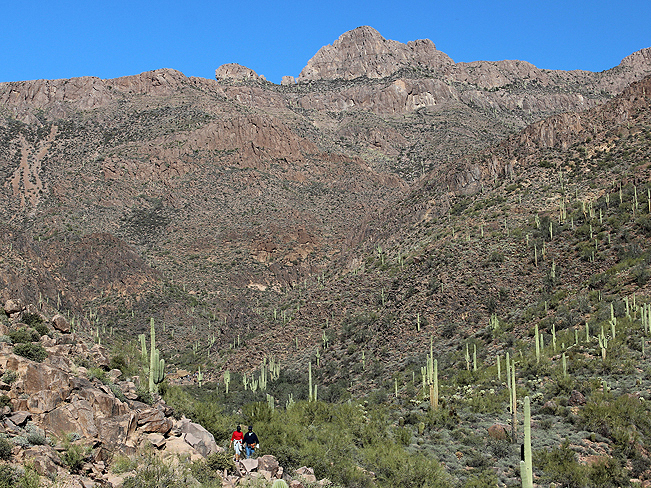 After completing the twisty drive through the streets of Gold Canyon to the trailhead, hikers are greeted by stunning views of the Superstition Mountains. At the far end of the range, the Flat Iron Plateau forms a dramatic silhouette. The Hieroglyphics Hiking Trail first zig-zags away from the trailhead and then makes an almost perfect bee-line towards the base of the mountain range. As the trail gently ascends across the dessert and approaches the mountains, the canyon walls seem to grow almost overwhelmingly in scale. No worries though! 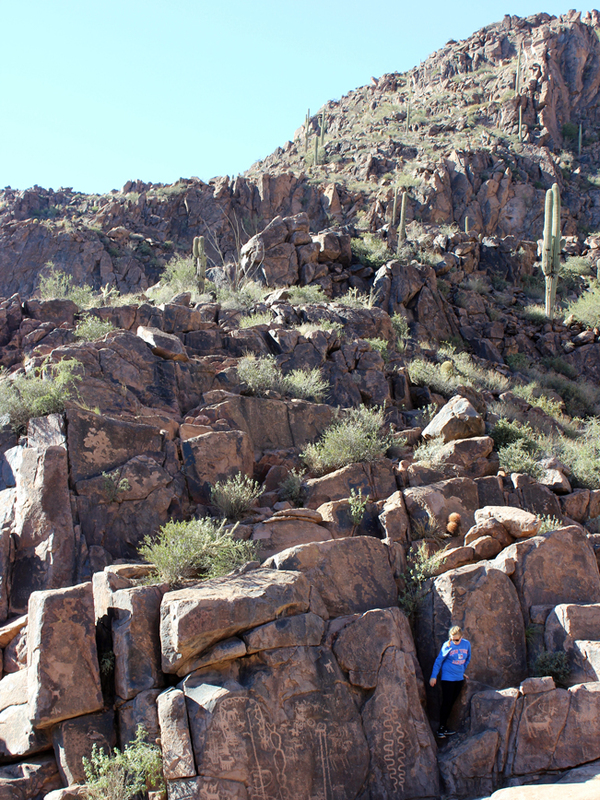 The Hieroglyphics Hiking Trail climbs only a small way into these gargantuan slopes. 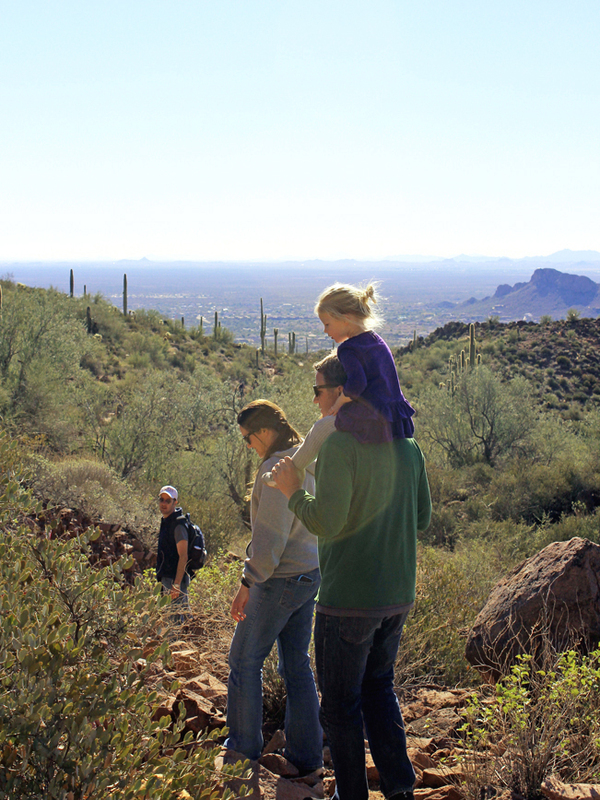 With each step, the scenery becomes increasingly beautiful – passing fields of Saguaros, mounds of boulders and expansive mountain vistas. A view back towards the valley reveals expansive views that stretch hundreds of miles to the horizon. Rounding a bend at the base of the rocky canyons, the landscape suddenly shifts. Here layers of tall vertical boulders stand alongside sparkling pools of water. Ancient hieroglyphics, carved centuries ago by native peoples, decorate many of these stone walls. Wide swaths of smooth granite form a perfect area to rest and enjoy the views over the valley below. 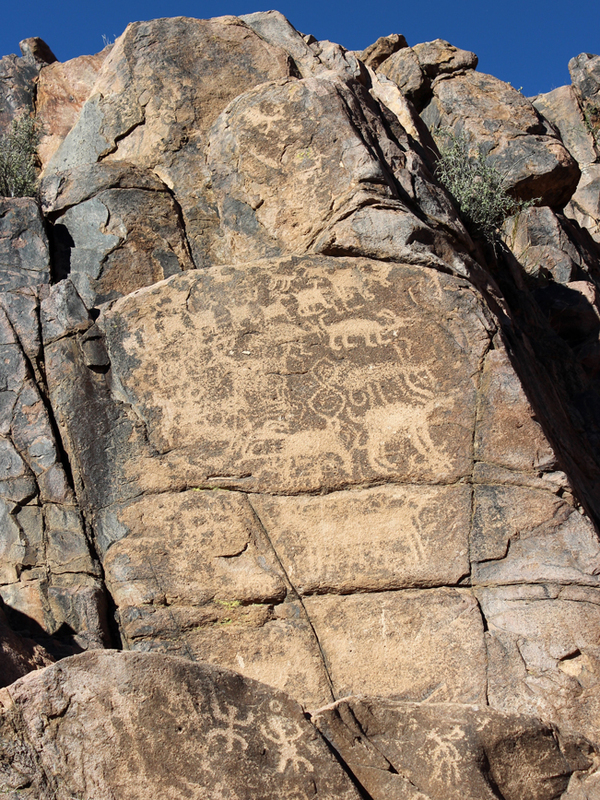 The hieroglyphs in the rock walls were carved by the Hohokum people – some over 1,500 years ago. Click here to download a trail map. The Hieroglyphics Hiking Trail is in red on the lower left side of the map. Directions: From the intersection of U.S. 60 and Kings Ranch Road (In Apache Junction), turn north onto Kings Ranch Road and drive five miles to Baseline Avenue. Turn right / east on Baseline Avenue and continue for 1.6 miles to Mohican Road. Turn left / north onto Mohican Road and drive 0.3 miles to Valley View Drive. Turn left / north west onto Valley View Drive (which becomes Whitetail Road), and drive for 0.3 miles to Cloudview Avenue. Turn right / east on Cloudview Avenue and continue for 0.4 miles to the trailhead is at the end of Cloudview Avenue.